It took me a long time to figure out that I needed to have a tender touch when making biscuits. 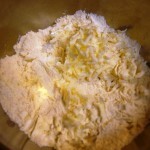 I was used to making bread, which the goal is to develop the gluten. 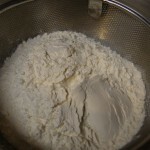 When making biscuits the goal is NOT to develop the gluten. Once that little piece of golden information was drilled in my biscuits came out beautiful and tender. 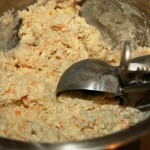 Depending on my mood or the meal I will make either drop biscuits or rolled biscuits. 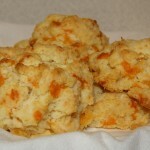 More often than not they are drop biscuits. I like the nooks and crannies. 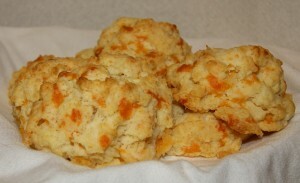 The other night I made drop cheddar biscuits to go with dinner. You can mix in anything, really. I’ve done ham and cheese, bacon and cheddar, cheddar and jalapeno to name but a few. And sometimes I do plain biscuits. 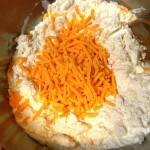 If you want to do plain, just omit the cheddar from this recipe. 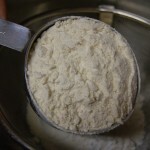 In a large bowl, sift flour, baking powder well. I use a fine sieve to make sure there are no lumps of baking powder. 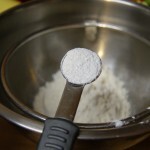 Nothing ruins the the enjoyment of a good biscuit than a bite into a clump of baking powder. Whisk in the salt. 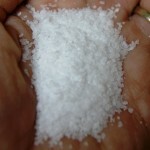 (Kosher salt doesn’t go thru a fine sieve). 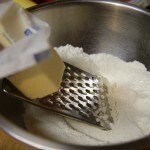 Grate the butter into the bowl and toss gently. (You can cut it in but I find this way works perfectly.) 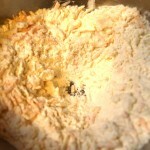 Mix in the grated cheese. 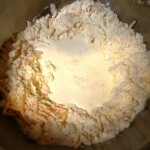 Make a well in the center of the bowl. Stir in milk gently. Do not over mix. This is where that gentle hand is required. 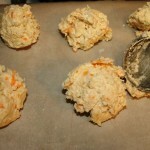 Using an ice cream scoop, scoop the biscuit dough onto a prepared cookie sheet. (I use a parchment liner on mine for easy clean up.) 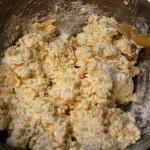 Bake 12 – 15 minutes at 425°.